Support does not just happen in a 1-on-1 or face to face setting anymore. Technology is now a Wellness Tool that can work for you to help you stay well – even in difficult situations. Read Sandra’s story below about how technology plays a crucial role in her staying well and living the life she wants to live. Technology and Social Media have proved invaluable for my wellness journey. There is so much available that allows me to connect electronically with others who I normally would not see, in addition to many tools that allow me to stay well, while in the comforts of my own home. Let’s explore some of these wonderful Wellness Tools that have helped me many, many times. 1. FaceTime ̶ My family, well, my son and his wife and my only two little grandchildren, live on the other side of the world, in Akita, north of Japan. Thanks to FaceTime, I can not only talk to them most days and see them opening their Christmas presents, but we have even begun to play complicated board games online. Previously, I had lost my “game companion” when she left our isles. Now, my other son comes to my house on a Friday at lunchtime and (a 9 hours difference Thorfinn, but he does not mind), we play Catan, Agricola, Caverna, Ticket to Ride, Dominion and more. We have a board here, in Orkney and Thorfinn has one in Japan ̶ it works, for all these games. That is a new and very welcome Wellness Tool for me! Also this year, my little sister in Oregon got an iPhone, so I am able to talk to her and her family face to face for the first time since she was last here 5 years ago. Therefore FaceTime offers me contact with my family, support and also fun! 2. Facebook ̶ is very important to me! I more or less journal on there and many people say that they have learned a lot from me about what it is like to be Bipolar. I get lots of encouragement and support from Facebook friends, whether they are ex-pupils (often), Bipolar friends that I met in the 1990s online, church friends, or sometimes, people who initially played online Scrabble with me, but have now come to “know”, follow and support me. There are two groups, especially, where I find personal support:”Bipolars Supporting Bipolars” and a private one we have in Orkney, connected to my church and others, called “Encouraging Women”, where we can ask for, and get, prayers. However, I must say that I have found that I can’t really use that if I’m in a Crisis ̶ some just don’t understand. I have friends who encourage me on Facebook all the time and it goes both ways! Facebook is also a way to keep in touch with you, Mary Ellen and, indeed, to have contact with other WRAP Coordinators, everywhere. Of course there are the WRAP groups, WRAP Facilitators (a closed group) and the Mental Health Recovery Group. 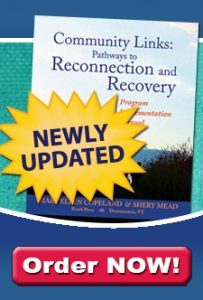 Facebook gives me news of my family and friends, photos and all the latest happenings with WRAP and Recovery, including new resources ̶ especially through the regular Newsletters. 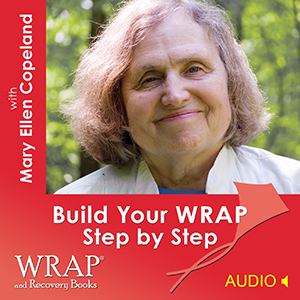 Follow Mary Ellen Copeland on Facebook and stay up-to-date with everything WRAP! 3. Internet Banking ̶ allows me to pay all my regular bills online and not have to leave the house. Now I can even shop for groceries online too, which really helps me not have to rely on anyone else taking me shopping and I don’t even need to go to the shops! Amazon, undoubtedly, makes it too easy for me to spend money, but, because of internet banking I can see my account at any time and (usually) not overspend. 4. 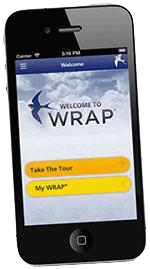 Apps ̶ I have an App on my phone for my Wellness Plan, which enables me to have my WRAP with me wherever I go! This is so important when I go to Japan to see my family. Last week I wanted to participate in one of Mary Ellen’s Webinars. I had tried to in the past, but I had not been able to do so and on the telephone from UK to USA it is quite expensive. I managed to download the Webinar App on my iPhone and hear most of that Webinar ̶ now I am all set for the next one! The wonders of technology! 5. Audio Downloads & CDs ̶ Through modern technology we can now access some of the WRAP resources by downloading them, thus saving the time and the cost of postage. So far there are three such downloads available, and I have all three. 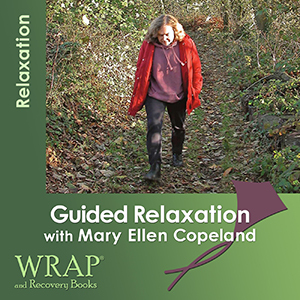 The first one, Guided Relaxation with Mary Ellen Copeland, is one I really should use more regularly as I rush about too much! The other two are just what I need as I am rewriting my Wellness Plan. 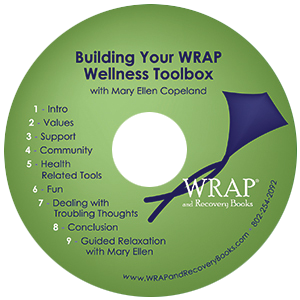 The Building your Wellness Toolbox download all about Wellness Tools and the Build your WRAP Step by Step download covers all of the sections of the WRAP plan. 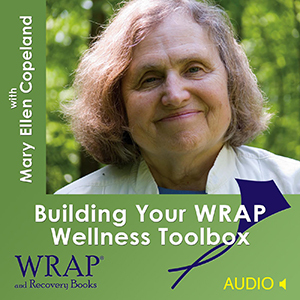 Many people could make up their own plans with these, but, also, for those of us who have already have plans, it is wonderful to hear Mary Ellen’s voice again, gently talking of the Wellness Tools and going through the plan. I am so glad that I bought these. They are going to be invaluable. 6. E-Books ̶ Although I am very fond of books, in paper form, I have also found electronic books to be a real necessity for me and my wellness. When I visited my family in Japan for 3 months, I found it very difficult to keep well, and would never have coped without my Kindle and my many e-books. Books and magazines in English were not readily available, so I relied on my Kindle and the ability to buy new books through Wi-Fi. 7. Email ̶ For many people e-mails would be included in this list of important technological Wellness Tools and I have been contacted through it. Indeed, that is how I received the information for Mary Ellen’s downloads. However, for me, e-mails are not as handy since I have over 10,000 unread e-mails in my inbox and more in other folders! I do need to do some serious decluttering! There are just too many opportunities to have regular posts about knitting, books, mental illness, recovery, Bible readings, etc…Sometimes technology can offer too much! I am amazed when I see how much I rely on technology for my continued Wellness and support. Facebook, for me, has been a lifeline. I sometimes think back to the year I had to spend in France as part of my degree when even the telephone system was unreliable! Now, when there was that serious earthquake and tsunami in Japan, my son was able to contact me on FaceTime almost immediately after to assure me he and the family were OK! I need technology and social media as a regular, integral part of my Wellness Plan. I was born in 1950 in the Orkney Islands in the north of Scotland, where I have lived for most of my life ̶ apart from my university and early teaching days in Aberdeen, Scotland and two years that I spent in France as part of my French degree and later with my husband and son in 1976. I married my childhood sweetheart, Charles in 1972 and we have two sons, Magnus and Thorfinn. Magnus lives and works in Orkney with his Dad and Thorfinn has been in Akita, Japan for 16 years. He is married to Kika and they have two children, Erik (6) and Isla (4). I think that I have always been bipolar, but it first became a serious problem when the boys both left home to go to university. I was teaching in the local secondary school and I was also a guidance teacher, which I loved, as I am, and always have been, very fond of children of all ages. My depression got so bad that I voluntarily went into the mental hospital in Aberdeen in 1998, where I was diagnosed as bipolar. This was no surprise to me, in fact I was almost relieved, as I thought that Lithium would “cure” me, having read Kay Redfield Jamison’s “An Unquiet Mind”. Of course, this did not turn out to be the magic answer for me, but I had begun to read books by Mary Ellen Copeland, which gave me ideas of things to do to get better. I lost my teaching job because of my diagnosis, something which could not happen nowadays, I hope and in 2000, at 49 years old, I was forcibly “retired”. I was delighted to get the opportunity to meet Mary Ellen at a day’s talk in Glasgow that year and I began to study, doing her correspondence course which led to writing my Wellness Plan. 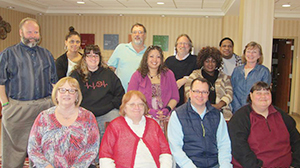 When Mary Ellen and Ed came to Birmingham to teach WRAP facilitators I was invited to join that course and a year later I asked to do the same course with her in Vermont. I had not been too stable in the first course as my retirement was just being organized and I greatly benefited from redoing it. I would love to go back to Vermont some time to do a refresher course or a retreat, but it is so far and with my grandchildren in Japan any travel I do in the future would need to be there, if I am able. I have twice spent three months with them, but I miss them very much.